There is one key ingredient found in the Can-C™ eye drops. This ingredient is a special grade of N-Acetyl-Carnosine which was formulated by researchers who developed the eye drops. Can-C™ eye drops were not designed to dissolve the cataracts or remove them as with surgery. Rather, they were formulated to address inflammation. Can-C™ drops are listed below. Active ingredients: Glycerine (lubricant) 1%, Carboxymethylcellulose sodium (lubricant) 0.3%. Inactive ingredients: Sterile Water (ophthalmic grade solution pH 6.7 to 6.9). Please read enclosed product insert for instructions on opening tubes. (*patented by Innovative Vision Products). I want so desperately to try these drops, but there are so many can-c drops that I want to be sure that the drops I buy are the original drops developed by the Russian doctor that proved results. i don’t expect any company to tell me that their drops are not the best but just a touch of honesty; to know that these are the original formula would be wonderful, and i will order them today or when i receive a reply. i need them badly. Yes indeed. These are the original, authentic Can-C drops approved by Innovative Vision Products. You are smart to ask in that many companies claim that they have the authentic Can-C eye drops, but sell something else. Hello Robert I too was recommended for eye surgery for cataracts. I really don’t want to go through with it. I am considering the eye drops. Is this the phone number to order them? I am 65 and one eye is getting bad. I’m also taking vitamins to reduce free radical damage. Thank you. I can say that I have used these drops – both the lubricant version and the original version and my vision is better. I don’t have the light sensitivity I had and my night vision is much better. car headlights coming at me used to be painful, but now i can keep my eyes straight ahead on the road and the lights don’t bother me. I’m not getting the glare anymore. but you have to stick with the drops at at the same time reduce your intake or eliminate refined sugar. The research showed that it is sugar that creates a protein that deposits on the lens of the eye. I am also trying to avoid cataract surgery for as long as I can. I prefer the lubricant version simply because my eyes tend to get dry and the drops are so soothing. I am on insulin for my diabetics and my eyesight is getting worse. My doctor said my cataract is bad and that I need to go for eye operation. I am looking at other options to surgery. Do you think that with my advanced diabetics , will Can-C eye drops clear my cataract completely. I ordered 2 bottles of Can-C from you about 2 years ago. But I could not proceed with further purchase because of my impeding financial constraints. Research reports application as directed shows approximately 95% success. Results are not 100% but odds are certainly in your favor. Evidence is that people with diabetes do experience relief, but it often takes longer because of the sugar spiking which causes flares of inflammation. My 16 year old cat has the beginning of cataracts and I thought I would get her the surgery, figuring it would be as easy as when humans get surgery to remove the cataracts. From what I’ve read it is very invasive and incredibly expensive. I don’t want to put her through the trauma of surgery at her age and am considering trying the Can-C eye drops. How long would I have to administer this to her? Will she experience any pain when the drops are administered? Average time in general to see results is 3 months. It can take much longer some dogs and cats depending on their overall health condition. Research shows positive outcomes in approximately 95% of subjects studied. Once it clears sufficiently, researchers recommend you reduce the dose back to one drop a day to keep inflammation under control. (and the acidic conditions are resolved). What is your return policy in case a patient cannot tolerate the product or does not achieve desired results? Thanks! A full refund is processed for all unopened boxes that are returned. I have a dog that has dry eye and requires Ketorolac drops and Tacrolimus Ointment in his eyes to manage the condition. He also is starting to get cataracts and having night vision issues. 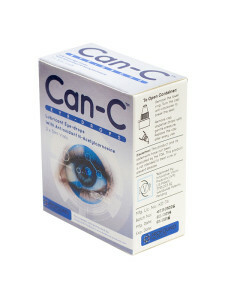 Can Can-C be used with his existing eye medications without causing any issues? Does this work for eye floaters? I had a macular hole in my left eye and had surgery to stop the hole from growing. This worked ok. However, the right eye now has floaters all the time.